Who is Roman Tesfaye ? 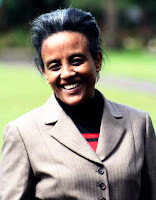 We would like to share with you a little background on the current Ethiopian first lady, Roman Tesafye . Lately there is a great rumor spreading about her parents and origin of birth. Here is an information we read from Tigrai on line on the PM wife. As a remark we strongly believe that it really doesn’t matter where you born, or who your biological parents are, what matters is your deeds! Obama’s dad is originally from the small city of Kenya, maybe he is from Qukuiu tribe, his son however runs for the second term of presidency in the great country of US. ! It is certainly yourself to change the world around you. Ethiopia Roman Tesfaye was born in a small town near Wolayta soddo called Gacheno from a Wolayta father and mother. She attended her primary education in Gacheno, and soddo Comprehensive High school. After completing her High school studies she went on to study at Addis Ababa University and graduated with her first degree in Economics. Roman Tesfaye also holds Second degree in economics from an Indian university and An American Institution in Leadership. Ethiopian National team made history!